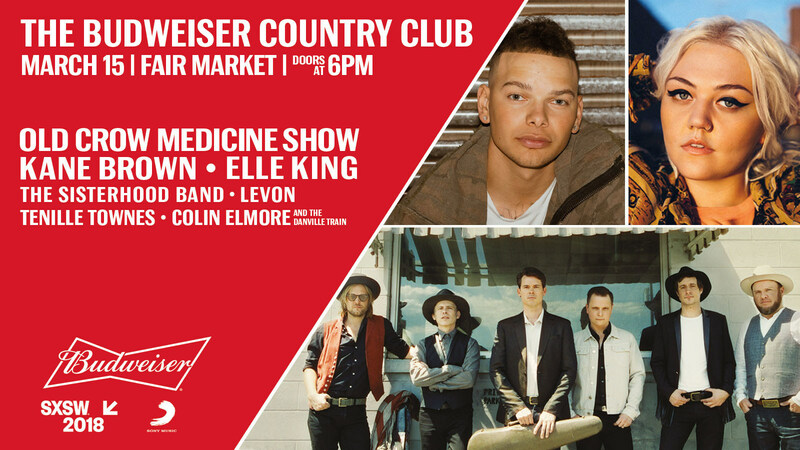 For the first time I can remember, Budweiser is throwing a country event at this years’ SXSW! They’ve teamed up with Sony Music Nashville to introduce the Budweiser Country Club. On Thursday, March 15 come check out some of the best in folk and Americana including performances by Old Crow Medicine Show, Kane Brown, Elle King, The Sisterhood, Levon, Tenille Townes, Colin Elmore & the Danville Train and tunes by Dee Jay Silver at the iconic Fair Market on the east side! They will have custom Budweiser merchandise, surprise meet and greets, food trucks, backyard games, and more! Be sure to RSVP HERE! Budweiser is getting back to their roots striving to create a meaningful experience in the country genre that is seriously underappreciated at one of the biggest cities for country music. The doors are at 6PM and there is room for 1,000 fans so get there EARLY if you are very excited to see two time Grammy winners, Old Crow Medicine Show, three time Grammy nominee Elle King, and other amazing artists on the bill. SXSW Music and Platinum badge-holders will have priority access to the event.